The Ibis World Trade Centre Dubai Hotel is perfectly located for both business and leisure guests to Dubai. 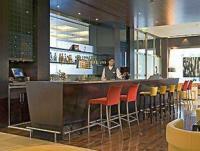 The hotel provides all the amenities that today's travelers desire in all of its 210 rooms. The hotel creates a balance of rich culture and modern convinience to ensure you a memorable stay. To make your reservation at the Ibis World Trade Centre Dubai Hotel quick and easy please select your preferred dates of stay and proceed with our secure online booking form.